Whether you do it professionally or as a hobby, racing is all about leveraging the best equipment and technology for a faster lap. Few pieces of equipment matter more than fuel cells, which provide the safety you need to reach the highest speeds quickly, all under the umbrella of FIA certification. 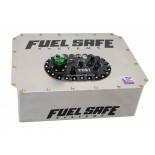 Fuel Safe Systems offers a wide variety of quality fuel cells, with a particular focus on aluminum ones. We carry these fuel cells in an assortment of sizes and configurations and are happy to provide customized cells to meet your specific needs. Whether you’re racing off-road, circle track or any other motorsport, we have the fuel cells you need to excel. 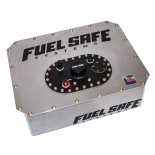 Fuel Safe Systems offers a range of sizes, including 5 gallon aluminum fuel cells, 10 gallon, 15 gallon, 20 gallon, and more. 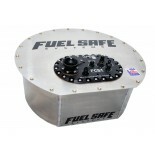 The Race Safe Aluminum Fuel Cell- This cell is notable for its distinct fill plate, featuring -8 rollover vent valve, -8 return, and -8 pickup. We plumb the pickup in-house to sit in the right side at the back of the cell. 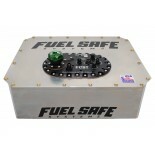 Fuel Safe’s standard fill plate is also equipped with a sending unit provision and aluminum fill cap. The Pro Cell Aluminum Fuel Cell- Also holding between 5 and 44 gallons, the Pro Cell fuel cell is prized for its coated seamless bladder, which adds flexibility and durability to create a racing cell that is suitable for all hydrocarbon fuels and alcohol blends. The Pro Cell aluminum fuel tank comes with an optional collector system that has three trap doors, and fuel pickup assembly that is installed during manufacturing. Complete Aluminum Pro Cell Fuel Cells are shipped race ready with Pro Cell bladder, foam baffling, nut ring, gasket and sending unit provision on its aluminum fill plate. 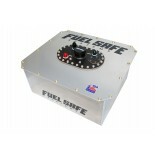 Fuel Safe offers three flange styles for aluminum cans, external top lid flange, the bottom flange, and a shoe box style lid. All Pro Cell fuel cells are now coated with black Aliphatic paint to protect your bladder from water and light degradation. 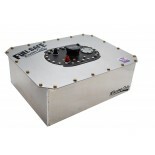 The Pro Cell FCST Aluminum Fuel Cell- Similar to the aluminum Pro Cell fuel cell, now enhanced with a rear-set FCST by Radium Engineering to prevent fuel starvation. This setup offers a lift pump, surge tank pump, and a fill neck configuration that is highly customizable. The Pro Cell bladder is coated in black Aliphatic paint to protect it from hydrolysis and UV damage. 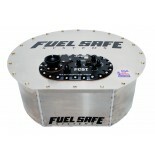 The Sportsman Aluminum Fuel Cell- Holding between 5 and 44 gallons, this fuel tank is FIA-FT3 certified, and can be filled with any hydrocarbon fuel. It comes with a fill plate with a customizable pickup, rollover vent valve, and return sizes, as well as a sending unit provision and the option of either remote or direct fill with a threaded aluminum cap. It is also notable for having a bladder that is made out of a proprietary coated fabric, which enhances performance while keeping costs low. The Enduro Aluminum Fuel Cell- The Enduro Cell is similar to the Race Safe cell, but is FIA certified and colored red instead of black (like the Race Safe). The Enduro bladder is made from cross-linked high-density polyethylene and is compatible with any hydrocarbon fuels as well as alcohol and an E85 blend. It also has anti-slosh foam baffling to prevent explosions and mitigate slosh; this baffling must be removed when fuels containing alcohol are used. 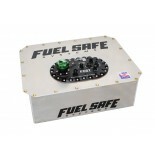 Fuel Safe is happy to customize any of our fuel cells to meet your specific needs. For more information, or to make a custom order, contact us today.